The China Low Carbon Leadership Network is a communication platform and includes a series of networking and consultation events involving the climate change sector in China. It is jointly organized by the China Carbon Forum (CCF) and The Deutsche Gesellschaft für Technische Zusammenarbeit (GTZ). 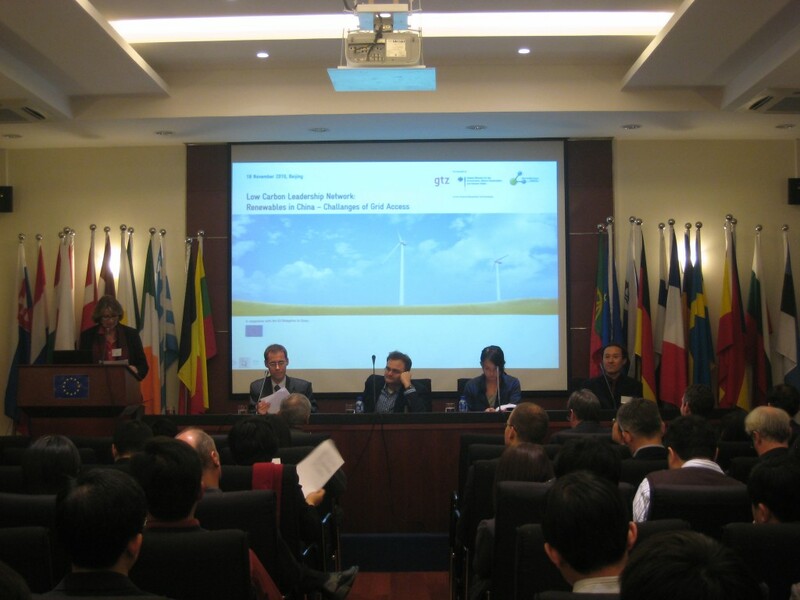 ‘Renewables in China – Challenges of Grid Access’ is the second event of the platform and was organized in special cooperation with the EU Delegation to China. ‘Renewables in China – Challenges of Grid Access’, the second event of the China Low Carbon Leadership Network, sought to engage stakeholders in the energy sector in a discussion on the barriers to integrating renewables into the Chinese grid. The three panelists present, including Professor Hu Zhaoguang, Vice Principal of the State Grid Energy Research Institute, and Mr. Sebastian Meyer, Director of Research and Advisory at Azure International, discussed the present state of renewable energy development in China, challenges facing renewables integration into the grid, and suggestions for overcoming these barriers. The panelists noted that installed capacity for renewable energy is increasing rapidly in China. The last official target for installed wind power capacity was 30 GW by 2010, which has already been surpassed, as 31 GW were installed as of mid-2010. There are ambitious targets for the next 20 years, as well as in the next Five Year Plan, including 150 GW by 2015, though this target will likely be surpassed given that there are 200 GW in development today. A target of 230 GW by 2020 has been predicted in Greenpeace’s China Wind Development Outlook 2010. The challenge of renewables integration into the grid was a major focus of speakers’ presentations. Panelists viewed the issue as both a technical and a policy problem, though a heavier emphasis was placed on the latter. Technical barriers include variation in renewables resources per region and year (particularly for wind), energy storage technology, balancing technology, and grid-to-grid connection. Policy barriers include an immature national electricity market, conflicts of interest between the provincial and national government with regard to renewables development, and a lack of incentives for grid companies to meet existing quotas for renewable energy production and to develop interregional transmission of wind power. A number of solutions were suggested to address these barriers, including a mechanism to share cost among all stakeholders and better pricing mechanisms, incentives on regional and national levels for grid companies to integrate renewables into the grid, and the creation of a national energy market. Such changes will require a strong market and policy response. Professor Hu also discussed the importance of Integrated Resource Strategy Planning (IRSP) and a strong smart grid for increasing energy efficiency. A strong smart grid can guide consumers on how to save energy and thus reduce pressure from the demand side while enabling electricity from renewable sources to reach the load centres. Demand side management must come first, after which measures to incentivize storage and flexible (gas-based) generation capacities can follow (via market signals). 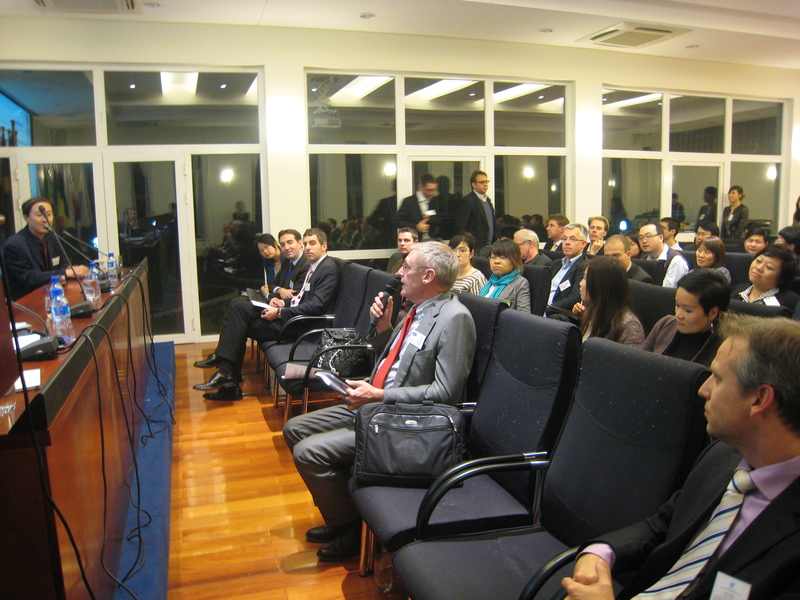 Over 70 people from industry, foreign institutions, NGOs, academia and Chinese government attended the event. Participants engaged in lively networking before and after the panel discussion.